The Pullo Center at Penn State York welcomes An Evening with Asia to its stage on Wednesday, September 17, 2014, at 7:30 p.m. Ticket prices are $49.50 and $39.50 and will go on sale June 20 at 10:00 a.m. Members can order now. Tickets can be purchased at The Pullo Center Box Office, charge by phone at 717-505-8900, or online at ThePulloCenter.com. Iconic British rock band ASIA is about to embark on its 2014 Gravitas World Tour, incorporating visits to Japan, the United Kingdom and the United States. The band is taking to the road in support of its acclaimed new CD, Gravitas, introducing its newest member, guitarist Sam Coulson. Asia’s debut album exploded onto the music scene in April, 1982, with several Top 10 singles including “Heat of the Moment” and “Only Time Will Tell”. It became the best-selling album in the World in 1982. 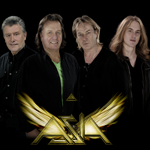 Featuring Geoff Downes on keyboards, Sam Coulson on guitar, Carl Palmer on drums and John Wetton on lead vocal and bass, Asia was the logical successor to their collective bands of the 70s – Yes, ELP, King Crimson, UK and The Buggles.